Why is it so hard to quit sugar? No matter how much will-power you muster against it, those cravings keep creeping up on you, especially during times of stress or when you’re feeling down. It’s not just you. Sugar is a highly addictive substance for everyone. Research shows that sugar stimulates the same brain pathways as some of the most addictive drugs, triggering a flood of dopamine in the reward centers of the brain, followed by an abrupt crash. Dopamine is a feel-good neurotransmitter that evokes a temporary sense of happiness and peace, leading to the same addictive cycles as cocaine and methamphetamines. Sugar also leads to a massive imbalance in the hormone insulin, which causes hunger signals in the brain to stay activated and to keep you wanting more and more. Along with these addictive physical responses, add in a busy and high-stress lifestyle, life’s constant stream of emotional curve balls, rampant food advertising and the plethora of sugary processed foods all over store shelves, and you’ve got your work cut out for you. Escaping carb cravings is no easy task. 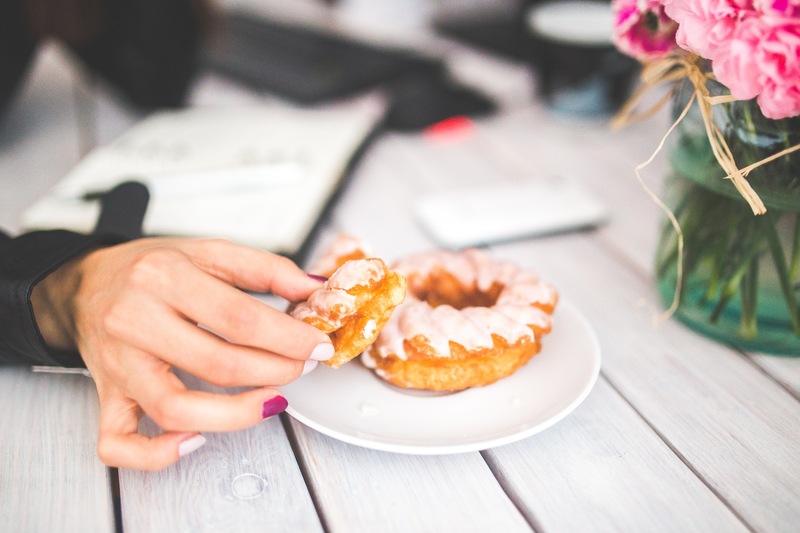 Unfortunately, the more you give in to these carb cravings and reinforce stress-eating habits, the more your metabolism and hormonal balance gets thrown out of whack. A high-sugar diet also shifts the balance of friendly and unfriendly bacteria living inside your gut and body, creating an unhealthy internal environment that promotes inflammation, insulin resistance, and other hormonal and nutritional disruptions that set the stage for weight gain, metabolic syndrome, type 2 diabetes, heart disease and obesity. Learn more about how your gut bacteria and microbiome affect your weight gain and weight loss. Quitting sugar may seem like just a simple matter of will-power and inner strength. But the interplay of stress hormones, wildly fluctuating blood sugar levels and a disrupted microbiome are all working against you, making a sugar habit a lot harder to sack then you might think. However, the faster you quit sugar, and the longer you stay off of it, the easier and easier it becomes to happily live a sugar-free lifestyle that’s no longer controlled by cravings, and to reap all of the high energy, good health and weight loss rewards that come with it. There are several natural herbs and spices that have been shown to help break the vicious carb craving cycle. They help to control cravings for sugar and high-carb foods while supporting a healthier and more balanced metabolism and hormone levels, and also offering several other health benefits as well. Two classes of herbs – bitters and adaptogens – are known to be quite effective at doing so, as well as several common pantry spices. Appeasing your sweet tooth with something bitter hardly sounds like a good plan of action that’s bound to succeed. But actually, it’s what our wise old ancestors have been historically doing for ages. It’s why eating wild bitter greens and drinking bitter brewed aperitifs before a meal are cross-cultural culinary traditions that have held strong throughout history, and still exist today – appetizer salads and cocktails, anyone? Bitter herbs have gone from ancient medicinal tonics to scientifically-proven natural digestive and health aides. Consuming them triggers a chain of reactions in the body that helps to improve enzyme and hormonal production, blood sugar regulation, food breakdown, digestion and elimination, while helping to reduce internal inflammation, infiltration of harmful microbes, oxidative damage, food allergies and other health issues. Studies have also shown that bitter greens have a remarkable effect on carbohydrate cravings. They also help to slow down the absorption of sugar and help to modulate the insulin response, so that blood sugar doesn’t spike as high and set off a vicious cycle of hunger and overeating. A recent study published in the Journal of Neurogastroenterol Motility showed that eating bitter herbs before a meal led people to naturally eat 20 to 30 percent less calories, while coming away from their meals feeling more full and satisfied. An added bonus is that many of these bitter herbs also contain abundant fiber and prebiotic starches that help to re-balance and re-flourish the healthy gut bacteria in your microbiome that help with sugar and fat digestion. Improve your health, lose weight and beat your longings for sweets by becoming bitter. One of the best ways to start is by eating fresh and healthy appetizer salads before your meals. Swap out your typical sweet lettuces for aromatic dark bitter greens such as chicory, dandelion, arugula, mustard greens, collard greens, radicchio, endives, turnip greens and others. Bitter tasting greens and roots (such as dandelion root, burdock root, radishes, etc.) can also be incorporated into delicious steamed dishes, soups and stir-fries. Another option is to make your very own bitter cocktail aperitifs by simply dripping in a couple of drops of bitters tincture (liquid alcoholic extracts of bitter herbs that you can purchase at most health food stores) into a glass of water, and drink this before your meal (use as directed on the package). Try making this titillating bitter greens starter salad with pomegranate, pear and pecans. Adaptogens are a group of herbs that herbalists recommend to protect your body from the negative effects of the stress hormone, cortisol. Elevated cortisol levels and chronic stress effect every system of your body, and can often lead to amped up sugar and carb cravings, anxiousness and irritability, weakened digestion, lower metabolism, depleted energy, weight gain, bone loss, advanced aging, illness and disease. Adaptogenic plants help to re-balance and normalize the internal processes that can otherwise leave you stress-eating and mentally and physically drained from stress. Adaptogens commonly recommended by herbalists include ginseng, holy basil, licorice root (not to be confused with the candy! ), ashwagandha, astragalus root, and certain types of mushrooms. These are most commonly sold in the form of herbal teas and herbal tinctures. Use as professionally recommended. Sugar and salt aren’t the only spices that make you feel good. There are several others that not only make you and your taste buds happy, but do so without the negative health effects, and even come with some heaping spoonfuls of their very own health benefits to boot. Spices such as cinnamon, nutmeg, cardamom, ginger and fenugreek have been shown to help quiet a voracious sweet tooth, curb carb cravings, balance blood sugar levels, boost metabolism, promote the production of feel-good neurotransmitters, sooth internal inflammation and other health benefits. Regularly incorporating these and other flavorful spices and herbs into your daily meals will open your mouth and mind to the wide variety and complexity of tastes and flavors that exist beyond the narrow pursuit of simple sweets. Experiment with bitters, adaptogens and culinary spices and herbs to discover a level of culinary satisfaction and fulfillment that lasts beyond the temporary highs and lows of sugar – and that comes to heal your body, instead of harming it.